This June 20, 1994 Vintage Time magazine is complete and in excellent condition with slightly yellowed pages. This vintage 1994 TIme magazine measures approx. 8" x 10 3/4" and is suitable for framing. 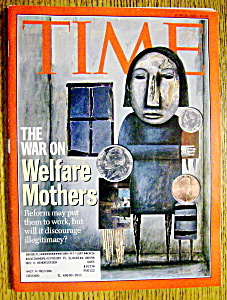 This Time Magazine's front cover features "The War On Welfare Mothers (Reform May Put Them To Work, But Will It Discourage Illegitimacy)" and the back cover features an ad for "Toyota Corolla". Full of news stories of the day and nice vintage ads.